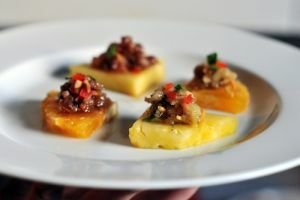 Pineapple Topped with Pork is a Cambodian appetizer recipe mixed with peanuts. Using electric blender or food processor, chop peanuts very finely and set aside. Using a heavy medium-sized skillet, heat oil over medium heat for 1 minute. Add onions and garlic and stir-fry 3 to 4 minutes, until soft but still golden. Add pork and cook, stirring constantly to break up chunks, until no trace of pink remains. Stir in the peanuts, sugar, salt, and pepper. Stir in the cornstarch mixture. Simmer over low heat, stirring occasionally, for 5 minutes, until mixture is thick enough to hold its shape. Lay out pineapple pieces on a platter or two. Top each with 1 teaspoon of the pork filling. Garnish each portion with a cilantro leaf.